The twists and turns in the Boise stadium saga have been epic. Last week, the Idaho Legislature threw a monkey wrench into Agon Sports & Entertainment’s and the city’s hopes of getting a stadium project done when it passed the law requiring public votes on the use of urban renewal money. This may not exactly be “Boise State to the rescue,” but the university released a statement Monday acknowledging that Greenstone Properties had asked it “to reconsider joining the effort.” Boise State said it has outlined a series of requirements that “could provide the financial and logistical incentive to consider joining” the project. Until then, the university is still working on its on-campus option as a home for the Broncos baseball program that begins play less than a year from now. It was almost a year and a half ago that Boise State pulled out of the Boise Sports Park originally planned for the old Kmart land on Americana Boulevard. But many have asked why the Boise Hawks and the Broncos couldn’t share a stadium since their seasons don’t overlap. The United Soccer League would be an issue, though, as its season began this year the second weekend of March. A USL franchise is conditionally set for Boise if the stadium project works out. Meanwhile, talking points listed by Boise State include “partial ownership, priority use, artificial playing surface and shared revenues.” There are masses of torches and pitchforks out there opposing this project. 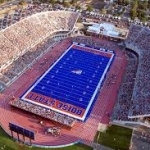 Whether Boise State’s possible involvement in it will help change the dynamic remains to be seen. Twigg was essentially the Kristin Armstrong of her day, enormously popular in the cycling world in the 1980’s and 90’s. She loved the Women’s Challenge and was engaging to fans and media. I was the announcer for all the stages during the first race in 1984, and I think I still have a shirt Twigg autographed calling me “The Mouth.” I’m going to look for it. Anyone who remembers her is inclined to reach out and help her. But, as Greenstone writes, “She still won’t accept housing for herself, even when help is offered by people who’ve found out about her state.” Twigg doesn’t want “unfair advantages,” something that always made her feel guilty. “Help should be provided for everybody, not just a few,” she said. This Day In Sports…brought to you by PEASLEY TRANSFER & STORAGE…a tradition you can trust! April 16, 1999, 20 years ago today: After a landmark 20-year career in the NHL, Wayne Gretzky announces his retirement. Gretzky’s pro career started at the age of 17 and peaked during his years with the Edmonton Oilers and L.A. Kings, as he won 10 NHL scoring titles. The Great One is hockey’s all-time scoring leader—by almost 1,000 points. Gretzky’s No. 99 is the only uniform number to be retired across the entire NHL.